Most toddlers need between 12 and 14 hours of rest (nighttime sleep and daytime naps combined) each day. When your little one falls short of this, her demeanor probably shows it with tantrums, meltdowns, and overall crankiness. That can easily happen on a busy day, but toddler sleep challenges from a need for a bedtime routine change to separation anxiety to plain old stubbornness can play into inadequate sleep as well. And as any parent of a toddler who refuses to go to sleep at bedtime, wakes up frequently in the middle of the night, or refuses to sleep alone knows, a child's sleep—or lack thereof—impacts your own as well, affecting your mood, mental clarity, energy levels, and overall productivity. If this all sounds familiar, you’ve probably heard the standard advice: Stick to a regular schedule, set a calming bedtime routine, and be consistent. But even with the best of routines, some toddlers and their parents have periods when sleep is hard to come by. Here are common toddler sleep troubles and solutions to get your family sleeping soundly again. Toddlers don’t like to miss out on anything, so when bedtime arrives, they often resist. In some kids, this looks like a sudden burst of energy as they engage in a game of catch-me-if-you-can. In others, bedtime resistance comes in the form of multiple requests for another story, a drink, one more lullaby, and so on. This obviously can eat into a child's rest. And for a tired parent who wants a little downtime at the end of the day, these rituals can be frustrating. If this is a pattern for your child, try to anticipate these behaviors and work around them. Helping your child burn off extra energy in a constructive way as bedtime approaches can help kids who get wound up before bed. To address constant bedtime requests, set firm boundaries, communicate your expectations, and follow through. If your little one consistently calls out for things after you’ve left the room, increase the amount of time it takes to respond. The sleep routine you likely set for your infant probably doesn’t work for your toddler. Rocking, nursing, bottle-feeding, giving a pacifier, and other nightly bedtime rituals fall away as your child matures, and it's helpful to create new routines to replace these. Sleep associations—anything that a toddler links with going to sleep—can be healthy and critical to setting up a bedtime routine so that your child's mind and body prepare for sleep. Parents might give their toddler a warm, soothing bath, brush their teeth, read a story, turn all the lights down low, sing songs—anything that helps to indicate that a calm, soothing bedtime is approaching. The trouble often comes when a sleep association is eliminated, like when you stop the bedtime bottle, take away the binkie, can’t find the beloved stuffed animal, or the parent who usually does the routine is not home. Give your child time to transition from her old routine, be as consistent as you can, and try to keep it simple enough that a babysitter or grandparent can perform it when you aren’t home. Even the best sleepers can go through periods of not sleeping well. Teething, sickness, and meeting new developmental milestones can throw off a toddler’s sleep schedule for a few nights or even a few weeks. This is referred to as toddler sleep regression. If you have ruled out the usual suspects, like teething or sickness, it is likely that she is going through a period of brain development. As toddlers learn new skills, it's common for them to wake up in the middle of the night to mentally—or physically—practice them. This usually lasts a few nights, then sleep returns to normal. But when middle-of-the-night wakings consistently disrupt the family, a new tactic for sleep training may be needed. Remind yourself that you are the parent and in charge of the situation and it is your job as the parent to set and maintain boundaries around sleep routines and schedules. Some toddlers just can’t seem to sleep alone no matter what you try, and the reasons may be hard to tease out. For many toddlers, separation anxiety may be the cause, especially if they do not get a lot of time during the day with their parents. If your child’s sleep trouble is caused by anxiety, take moments during the day to talk about it. Offer your child extra daytime cuddles and love, and be sure to praise her any time she sleeps through the night in her own bed. Children who have sensory processing difficulties may also have a hard time sleeping alone because their sense of proprioception is off. Proprioception is a complex series of muscle and nerve communications that tell your brain where your body is in space. If a child has difficulty with this, they may wake up frequently at night and have a fear of falling out of bed. If you suspect proprioception is keeping your child from a good night's sleep, try placing your child’s bed next to a wall, placing their mattress on the floor, or wrapping up your toddler like a burrito at bedtime. Even if you’ve taken precautions to make co-sleeping as safe as possible, it may not be the best choice for everyone involved. If your sleep or your partner’s sleep habits are disrupting your child’s, she may not be getting the amount or quality of rest she needs. A toddler needs much more sleep than an adult—roughly 13 hours compared to an adult's 7 or 8 hours. 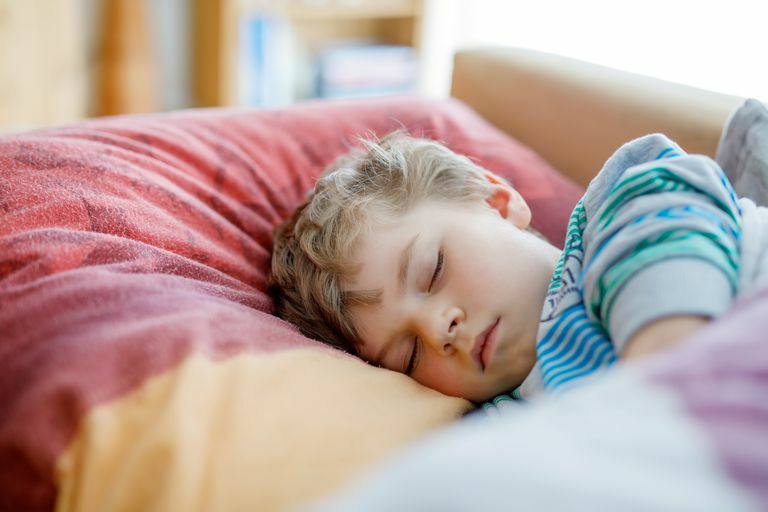 If your child regularly goes to bed late and wakes up early (as many adults do), then she's probably not getting enough sleep or is compensating for the loss by falling asleep in the car, at the lunch or dinner table, or wherever she can. More commonly, though, problems with co-sleeping arise because parents started a sleep association (like falling asleep in the child's bed) that they no longer want to be involved in. If co-sleeping is a problem for your family, setting new sleep associations and bedtime routines will help. Try reading your child a book in a nearby chair before tucking her in, for example. According to the American Academy of Pediatrics’ safe sleep recommendations, co-sleeping may increase the risk of SIDS, unintentional death, or injury in infants and small children. If nighttime troubles are keeping your family up night after night, it may be time to try tough love and sleep training. The first week of this will be the hardest, but if done consistently it shouldn't take longer than two to three weeks for a new sleep habit to be established. Once the bedtime routine is set, reinforcement is essential. If your child won't stay in bed or comes into your room in the middle of the night, walk the child back to her room and tell her that she needs to stay in bed and sleep. Be calm but firm. Once you've set the expectation, say goodnight and leave. If your toddler gets out of bed again, calmly take her back without making a big production out of it. Keep your voice calm as you restate the expectation firmly. If your child will not stay in her bed, try sitting near but not on the bed to physically reassure her of your presence and easily place her back. Do not allow her to sit in your lap or be out of the bed. Tell her once that you are going to sit right there and that she has to stay in bed. Then, do not do any more talking and just wait her out. Do not go to sleep on the floor next to her bed or get into the bed, no matter how tempting it may be. When she's asleep, leave the room. After the first week, you should see a steep drop in the amount of time it takes for your child to accept the limit and go to sleep. Each day should get a little easier. It will take time, but with patience and consistency, your family will be on its way to a peaceful sleep. American Academy of Pediatrics. SIDS and Other Sleep-Related Infant Deaths: Updated 2016 Recommendations for a Safe Infant Sleeping Environment. Pediatrics. 2016.